After about 9 miles of hiking, we cross the boundary into Crater Lake National Park. I’ve been hoping that this management body will have gotten their chainsaws out. YES! Words cannot describe the relief I feel when seeing fresh sawdust on the ground next to cleanly cut logs on either side of the trail. Still, the miles start to get to me. My feet are sore. The trail is dusty, and I think the amount of grit getting into my shoes has caused the heel area up by my achilles to tear, and I worry that it’s starting to create a blister. All the thru-hikers are wearing colorful gaiters. I should have gotten gaiters. It’s so damn hot. I pass a stump that looks like a kind of strange beast and take its picture. Another super fast thru-hiker passes us on this long, hot, flat stretch. There’s no water, no cool creek to dip my toes in. The water in our bottles is hot. Our food is gone. No reason to stop, so Marc keeps hiking, hiking hiking. I look up at the sky, remembering last summer and all the ways I knew my dad was looking out for us. I’m so tired. This is so hard. And I make a deal with him. 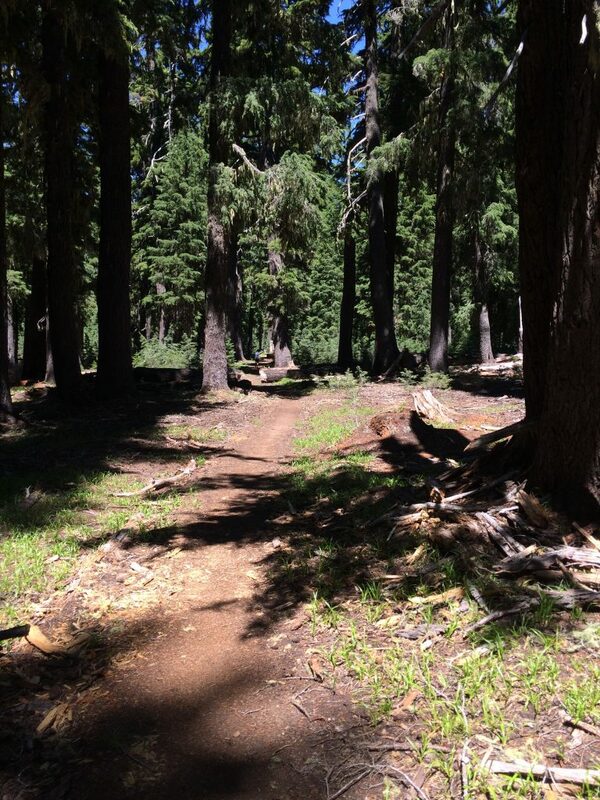 We get to the turnoff for Annie Spring, and take the trail down to Mazama Village. And when I say down, I mean DOWN, as in steep, steep, steep. To get to the Rim Village and our hike the next day, we’d have to go back up this very trail. I get even more despondent. No way can we hike 26 miles plus however many uphill miles it will take us just to get to the starting point! Marc tries to bring the subject up a couple of times, but I shut him down. I don’t want to talk about it, I say. We can deal with it tomorrow. All I have room for in my brain right now is ice cream and beer. We reach the store after some hot road-walking and gratefully dump our packs. Lots of hikers lounging around. Inside, we ask a woman at a desk about cabins, hoping against hope there’s one available. Nope. 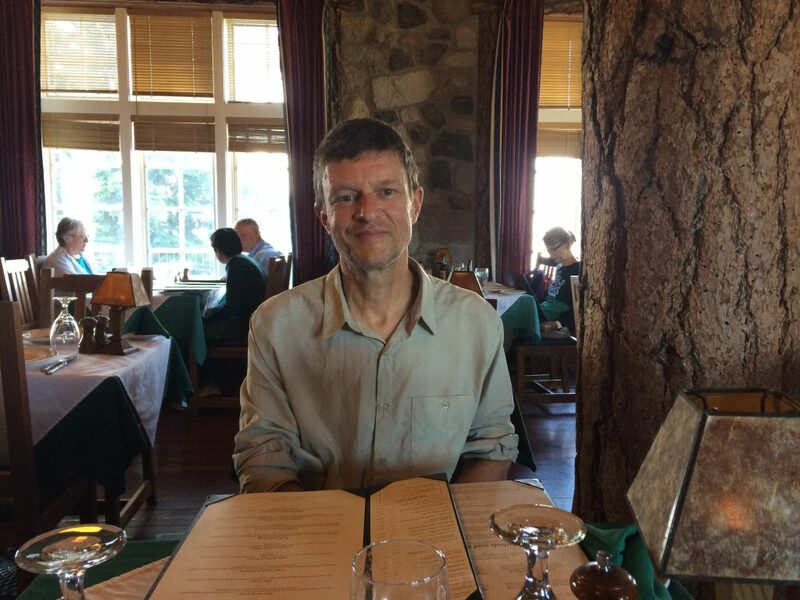 I ask about the Lodge — the turn-of-the-century glitsy thing up at the rim that hikers don’t usually frequent, because it’s too expensive. No way, she says, there’s a big event this weekend, a symphony coming, celebrating the 100 years of the NPS, it’s going to be like the fourth of July. But I can check anyway, she says. Just in case. Do that, we ask. She calls. Her eyebrows tell the tale. There are —not one, but TWO —rooms available! Then she hangs up. They’re not even that expensive, considering — $210 and $220. At this point, I would almost have paid double that amount. We’ll take one!! Marc and I clamor, pulling out our credit card, and she calls back and passes us the phone. Done. But when I ask about the shuttle from Mazama Village to the Rim Village, I learn that there are two a day, at 9 and 11 in the morning. We will have to collect our box and then hike, in the heat, back up that awful trail. I cannot even wrap my mind around this. I go back outside to my pack and almost literally run into Brownie. She’s eating an ice cream bar. I can’t believe it! We embrace and it turns out they she and Dizzy have been driven in by their son and his wife to pick up their hiker box. In a few minutes they’re heading back to their car campsite. Sure, they can give us a lift up to the lodge! My heart does another somersault. What are the chances? We quickly claim our hiker box, buy a nail clipper for Marc and a couple of ice cream bars. We all cram into the little rental car —our packs miraculously fit into the trunk — and they drop us off at the lodge. I hug them both, amazed at the turn of events, and exhort Dizzy to make sure he eats at least 5,000 calories a day. The staff at the lodge don’t seem to mind our state of decriptude, and are so polite it’s almost painful. 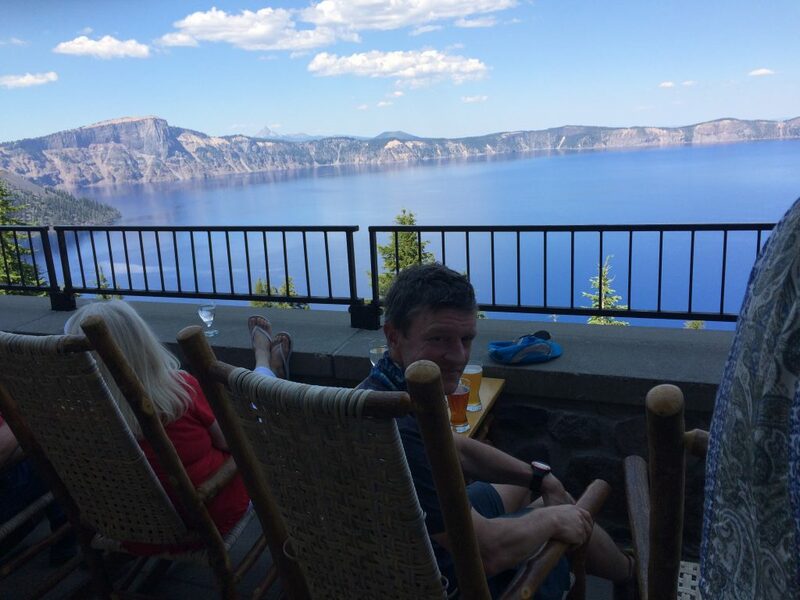 We have to wait until 4:00 for the room, but no problem, in the meantime we can park our backsides on the magnificent porch, order beers and soak in the view of Crater Lake. We enter into conversation with a man who tells us about the symphony thing going on. Another woman tells us there’s a forest fire nearby, and that’s why the air is hazy. I hadn’t really noticed, to be honest. Once 4:00 rolls around, we go upstairs to our room, shower, wash our clothes in the bathtub and organize our resupply. 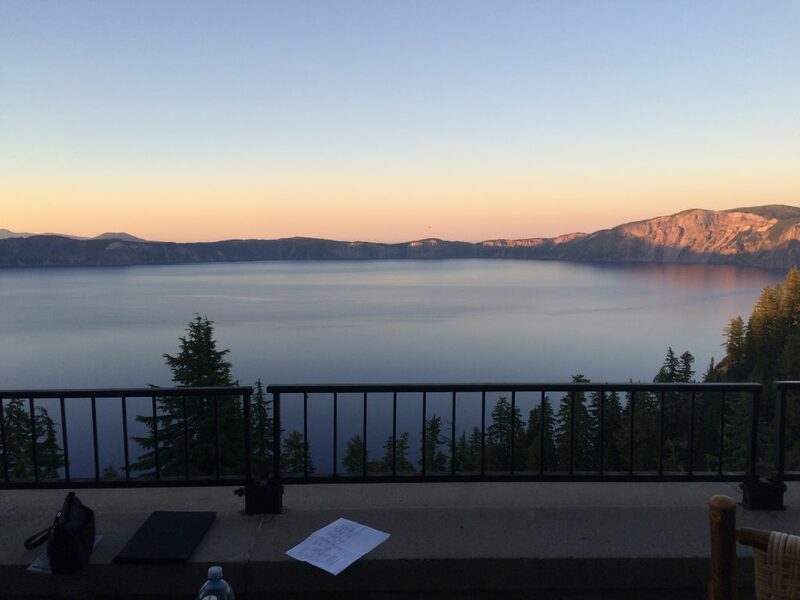 While Marc is in the room catching up on his e-mails, I go back down to the porch and soak in the sunset over the lake. Thanks, Dad. You really came through. 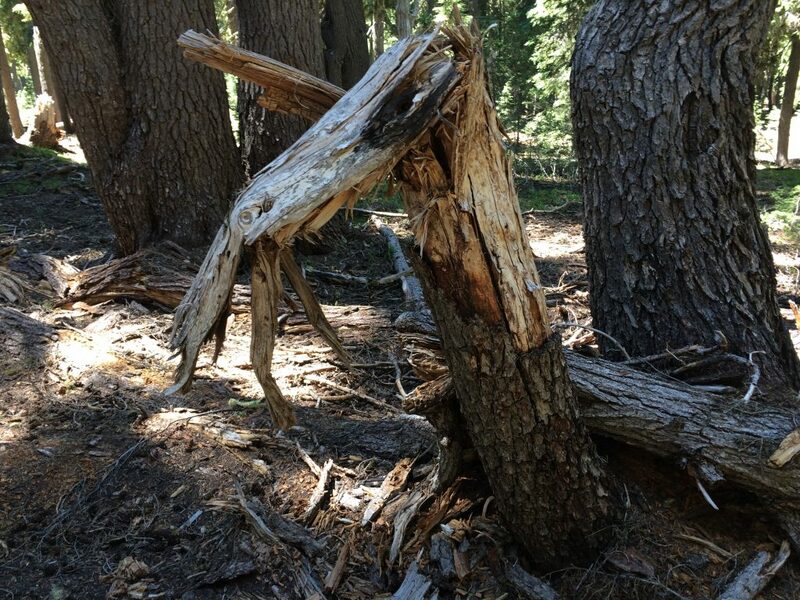 This entry was posted in Hiking, PCT Oregon 2016 and tagged backpacking, Crater Lake, hiking, Oregon, Pacific Crest Trail, PCT, trail angel by gydle. Bookmark the permalink.